A couple of Thursdays ago, I was at the Plymouth with some friends for import night. Import night is awesome because a beer lover such as myself can have the chance to inexpensively try some brews he's never had before. Since much of a beer geek's life revolves around the pursuit of delicious beer and enjoying the company of friends around such beer, I was a very happy drinker that particular Thursday. As friends are apt to do, someone bought me a beer. The evening had just gotten even better – or so I thought. Glancing down at the label, I noticed the signature green and red of the corporate identity. I cringed inwardly (one does not cringe outwardly when one's friend buys him a beer: Very bad manners, that). Speculating that perhaps this particular swill was not as bad as I remembered it to be, I took a pull off the bottle. "See?" my inner voice said, "It's pretty good. You used to love this stuff in college. Nope. Not bad at all…"
My inner voice is an idiot. Who was I kidding? It was awful. As soon as that particular skunky funk hit my nostrils, I was transported back to a world where the aroma of stale pools of mass-produced corporate beer permeated the frat house every Saturday morning. I smiled at my friend, thanked him, sneaked off to the other room, and left the bottle on the bar. I was just not that thirsty. There is a saying among beer geeks: "Life's too short to drink crappy beer." Luckily, none of us have to! Because this is the golden age of beer. Glorious sweet ambers and strong coffee stouts are being brewed all over the world by a new generation of brewers who take their craft very, very seriously. And we craft brew fans can all take advantage of the fact that it's the start of the beer festival season. WQLN kicks it off right every year by assembling thirty-plus of the finest brewers anywhere for two sessions of micro-brewed awesomeness. And they are back this year with the eighth annual Erie Micro Brew Festival at the Brewerie at Union Station. Tickets are thirty-three bucks in advance and an extra five dollars at the door for the chance to taste more than a hundred individual beers – and not a PBR or Miller Lite in the bunch. I do not recommend that you wait to buy: According to organizer Tom New from WQLN, the second session always sells out and tickets for the first session this year are going fast. But which session to go to? The afternoon session runs from 1 until 4 p.m. It is usually less crowded than the evening session, but even a sell-out does not mean long lines for tasting: people love to chat up the brewers, but are courteous and don't hold up the line. Queues move pretty fast, so your glass won't be empty for long. Host Chris Sirianni expanded the tasting rooms a couple years ago into all four rooms of The Concourse and Brewerie at Union Station, so now there is plenty of elbowroom for hoisting your frothy beverage. The evening session runs from 5 until 8 p.m.
You will find slightly different crowds at each session. The early group tends to be more connoisseur-heavy, with the conversation revolving around the subject of beer, food, wine, cigars, art, and literature. The late crowd also talks about their love of beer, but they are more likely to discuss what bands are playing out later; either way, the beer is delicious and the people are friendly. If you have trouble meeting new people at social events, I guarantee you will not have that difficulty here. If you never know what to say to strangers, just ask them what they think about the contents of their glass. No one is a stranger at the Micro Brew Fest. Sirianni says that if you want to try every single hard-to-find specialty beer, go to the first session. Occasionally, there is a run on a particularly awesome selection and the keg empties quickly. But don't despair. With the current total at 39 brewers, there will be plenty of new suds to try. Kalamazoo, Mich.-based Bells Brewery, for instance, will be pouring a rare and expensive golden rye called "Smitten." The brewers from Rust Belt in Youngstown, Ohio are making a return after a two-year absence. Gordon Biersch, a well-known brewery in California, will debut a selection of tasty ales and lagers from its new brewpub in Buffalo (How can he go wrong with a name like "Biersch?"). Last year international heavy-hitters Rouge and Samuel Smith's brought more than a dozen beers each. Samuel Smith's – Yorkshire, England's oldest brewery, founded in 1758 – made my favorite Christmas Beer this year, a warming spicy concoction they titled "Winter Welcome." Rouge, on the other hand, is legendary for being among the first breweries to make truly "big" beers. Their Dead Guy Ale is a thick, malty blast of taste-bud-crushing flavor. I am hoping they bring some of their more off-the-wall beers for us to try, like the chocolate/peanut butter/banana ale or the pale ale flavored with juniper. This event stands apart from other nearby beer festivals because of all the brewers that are there. It's not just volunteers and employees pouring. Organizers Sirianni and New put a lot of effort into making the participants happy so they will show up year after year. With few exceptions, the person filling your glass will be someone directly involved in crafting the beer you are drinking. This means that you get to meet and talk to Andrew Maxwell from the Rivertowne Pourhouse. Ask him how he managed to make a pineapple beer that is so impossibly yummy. John Najeway from Thirsty Dog can tell you the stories behind each of the pooches pictured on his labels. You can talk to Erie Beer Society President Jeff McCullor and homebrewer Steve Anthony who are bringing samples from their new venture – The Erie Ale Works. (I can't tell you how excited I am about this new microbrewery coming to Erie this year. I'm all a-tingle!) And of course you can join the unruly army of admirers crowding around Sprague Farm's table offering up loud toasts – Prost! Just like the patrons, the brewers and owners of these small businesses come for the camaraderie. They love to hang out with us – people who also have a passion for good beer – but this event also lets them let down their hair and enjoy the company of their fellow brewers. After most beer festivals, vans are packed, kegs hoisted, tables folded, and people head home. Here, brewers stay late for dinner provided by the Brewerie. They laugh and joke try each other's creations long after the doors have closed and we lucky customers have all gone home. Owners Brian and Minnie Sprague of Sprague Farm and Brew Works are flying home early from the national Craft Brewers Conference in Denver just so they can pour beers at Erie's Micro Brew Festival. Sprague Farm won the fan favorite brewery vote two years ago, and when asked what makes their corner of the room so popular with the attendees, Minnie says, "Oh, we're just wonderful people." Then she smiles and secretively mutters, "actually, we pay them." Sprague Farm is only one of the many representatives of Crawford County that will be there. With three other microbreweries to its name, Crawford County may make more craft beer per capita than anywhere else in America. Home brewers in Crawford County actually outnumber those in Erie. Many of both groups will bring samples of their wares. If you are one to shun drink made by "amateurs," don't be. Remember, 90 percent of the professional brewers here began as home brewers. The best lager I drank last year was a dry pilsner one of members of H.A.Z.A.R.D. home brewers brought. With so many beers to try, it's rare to go back for seconds on anything, but I managed to refill my glass three times with this ambrosia. The other spectacular taste discovery last year was the crowd favorite, VooDoo Brewing Company's Cowbell Imperial Oatmeal Milk Stout. This small-batch nectar of the Gods was crowned the finest malt-forward beer of the festival by the judges from the Erie Better Beer Bureau (check out their reviews at eriebetterbeer.com). If VooDoo does not bring another keg of this sweet brew this year, I shall be very put out. I got a beer fever, and the only prescription is – More Cowbell! Let's not forget the other reason that this beer festival is special: All the profits go to support WQLN – Erie's amazing public broadcasting company. We may take it for granted, but there are very few cities the size of Erie that have a cultural resource like this. With The World Cafe, The TED Radio Hour, and Downton Abbey, we in Northwest Pennsylvania get the same information and entertainment as the big cities. WQLN keeps us connected to the wider world and keeps us engaged in the country's conversation. This fundraiser makes more money for WQLN than an entire week's pledge drive. When you buy a ticket, you support an important regional nonprofit and get to drink great beer with great people. And that – just like all of the great craft brew that soon fill The Brewerie – is worth raising a glass to. Skol! 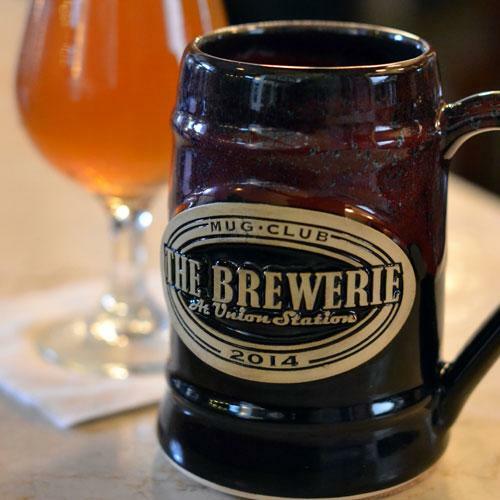 The Erie Micro Brew Festival will be held at The Brewerie at Union Station, located at 123 W. 14th St. Saturday, April 12. The afternoon session runs 1 to 4 p.m., and the evening session runs 5 to 8 p.m. Tickets are $33 in advance and are available at WQLN.org or for cash at the Brewerie and Beer and Pop Discount Warehouse.